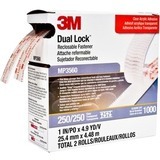 3M Dual Lock Reclosable Fastener have been used extensively in transportation, electronics, business equipment, machinery, medical and sign and display markets. When the mushroom shaped stems interlock, tensile strength is high enough to replace mechanical fasteners in many applications. Yet you can readily open and close Dual Lock fasteners hundreds of times. High temperature and solvent resistant. Clear, polypropylene reclosable fastener with a VHB Tape pressure sensitive 250 stems per square inch in a convenient package.